Spanning the stage, the eight great tormas at the 35th Kagyu Monlam celebrate the Eight Great Chariots of the Practice Lineages — the eight principal traditions which brought the Buddhist teachings from India to Tibet: Nyingma, Kadampa, Lamdre, Marpa Kagyu, Shangpa Kagyu, Shiche, Jodruk [Six-Branched Application] and Nyendrub. These traditions encompass the major schools and lineages within Tibet and were particularly important to the Ri-mé movement and to Jamgön Kongtrül Lodrö Thayé when he compiled his work The Five Great Treasures. The tormas have been made by a team of monks and nuns, working in the Monlam kitchen and the Monlam Pavillion. 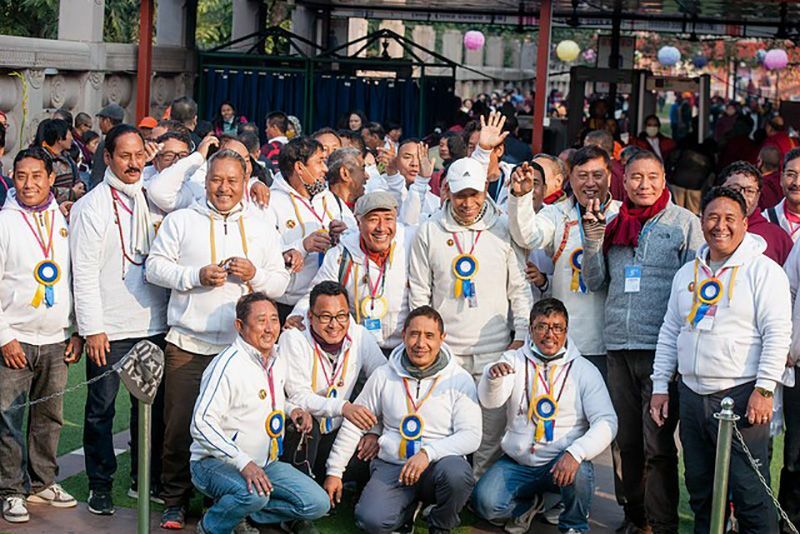 Because this year’s Monlam had to be postponed, many of the experienced torma makers had to remain in their monasteries and nunneries for the Great Gutor Mahakala puja before Losar and fewer monks and nuns were available to make the tormas. Consequently, the fifty or so team of monks and nuns had to work from 7.00am in the morning until 10.00pm at night in order to complete all the work for the Kagyu Monlam Chenmo. In addition, they had to prepare the tormas for the Kagyu Monlam Losar celebrations. Work began on January 28th. For the first two days the team worked hard to prepare the basic materials. Then they began the preparation of the images. For 16 of the monks and nuns, this was a steep learning curve — their very first time making torma. Each torma has four sections: the uppermost section contains the image of a bodhisattva, below that is the image of one of the Buddhist teachers associated with the tradition. The middle section contains offerings, and the lowest section contains one of the offering goddesses. 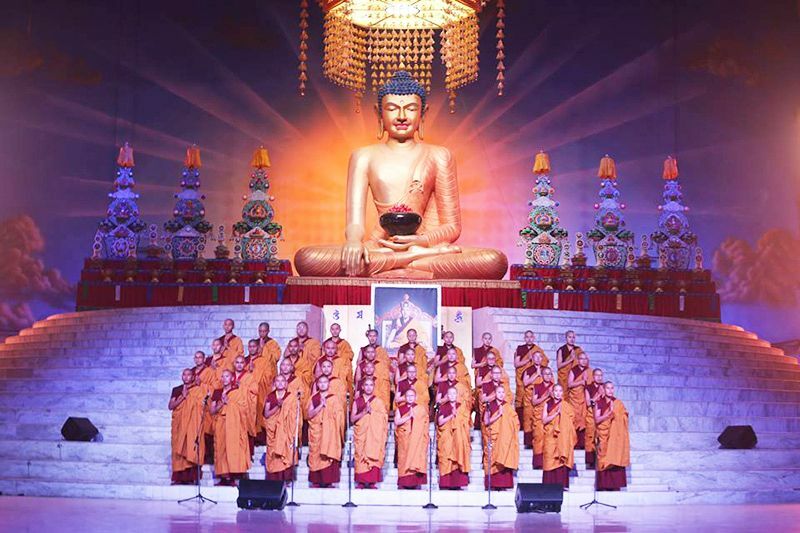 From the left of the stage, the first torma celebrates the Nyingma Lineage, named because it was the original Buddhist tradition which came to Tibet, and known as the Old Translation School. The tradition contains the teachings of the kama, terma and pure vision traditions. Originating in India, these teachings came down through Shantarakshita (725 -788 CE) the abbot of Nalanda University in India, Guru Padmasambhava and the second Dharma-King of Tibet, Trisong Detsen (755-794 CE). The torma is headed by the Bodhisattva Manjushri. 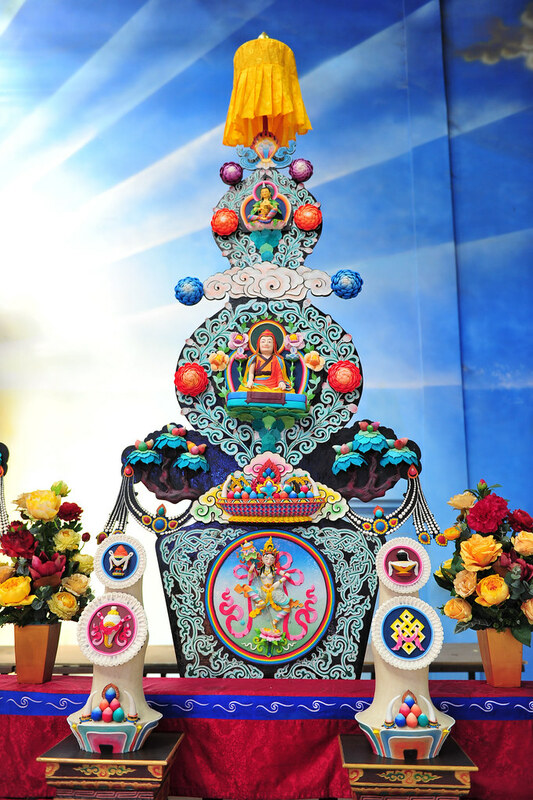 The central figure in the torma is Padmasambhava and the offering goddess is the goddess of the Great Parasol. The second torma celebrates the Kadampa Lineage — the teachings of the Old and New Kadampa traditions, founded by Lord Atisha Dipamkara (c.980 – 1054 CE) and developed by the reformer Je Tsongkhapa(1357–1419 CE) founder of the Geluk school of Tibetan Buddhism. Bodhisattva Vajrapani is in the uppermost section. The central figure in the torma is Lord Atisha who was responsible for the second introduction of Buddhism into Tibet, and the goddess bears the two Golden Fish. If there is grasping, you do not have the View. The bodhisattva is Avalokiteshvara and the goddess holds aloft the Vase of Great Treasure. The fourth torma celebrates the Marpo Kagyu Lineage, the teachings within the Kagyu traditions that stemmed from Marpa, Milarepa and Gampopa, and branched into the four elder and eight younger Kagyu lineages. The great lay practitioner Lord Marpa Lotsawa (1012–1097 CE) is the central figure. He travelled widely in Nepal and India, studied with the greatest Buddhist teachers of his time and brought many Vajrayana transmissions back to Tibet, including the lineages of mahāmudrā meditation which have been preserved in the Kagyu tradition. The bodhisattva atop the torma is Kshitigarbha and the goddess offers a precious jewel. 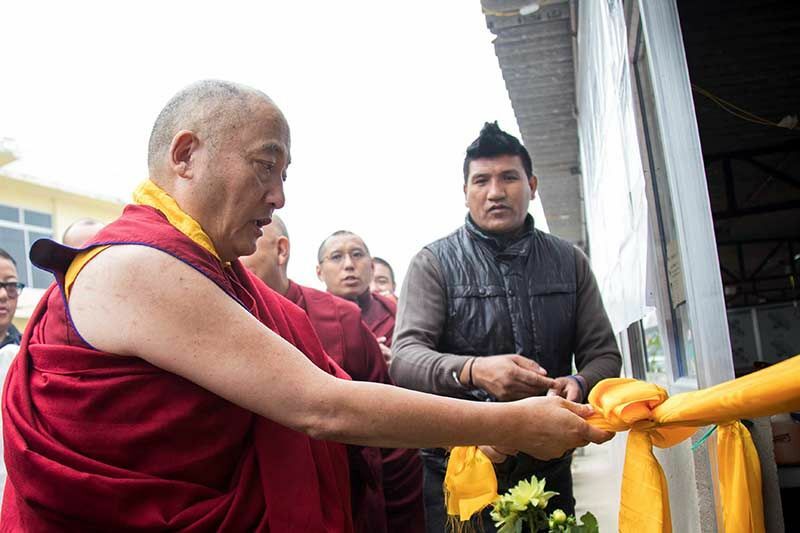 The fifth torma celebrates the Shangpa Kagyu Lineage. This tradition originated in India from the dakini Niguma and was brought to Tibet by Khyungpo Naljor, a student of the Kadampa Geshe Langri Tangpa. Its name is derived from the place where Khyungpo Naljor established his monastery. On the torma, the bodhisattva is Sarvanivaranaviskambhin. The central figure is Khyungpo Naljor and the goddess is the goddess of the White Conch. The sixth torma celebrates the Shiche and Chöd Lineages:—‘the Pacification of Suffering' and ‘Genuine Dharma of Severance’ [Chöd]. This is the tradition which comes from the Indian master, Padampa Sangye (11th Cent.- d.1017 CE), who visited Tibet more than five times. Padampa Sangye’s main disciple was the yogini Machik Lapdrön (1055-1149 CE), who went on to establish the Mahāmudrā Chöd tradition in Tibet. The bodhisattva is Akashagarbha. The central figure is Padampa Sangye. The goddess holds the Eternal Knot. The seventh torma celebrates the Jodruk Lineage:—the Six Branch Practice of Vajra Yoga. This tradition includes the unique perfection stage of the Kalachakra Tantra only preserved by the Jonang. Seventeen 17 Kalachakra traditions came to Tibet from India. In the 13th century, Kunpang Tukje Tsondru united these traditions into the six-branch yoga of Kalachakra. He lived as a hermit in a cave near Jonang whence the Jonang tradition derived its name. The most renowned abbot of Jonang was Dölpopa Sherab Gyaltsen, known as the Buddha from Dolpo, (1292–1361 CE), famous for his exposition of the shentong view. Dölpopa is the central figure in the torma. The bodhisattva is Maitreya and the goddess carries the Victory Banner. The final torma celebrates the Nyendrub Lineage, which preserves the tradition of The Approach and Accomplishment of the Three Vajras. At the centre of this torma is the Great Yogi Orgyenpa Rinchen Pal, who received these teachings directly from Vajrayogini, the mother of the buddhas. Orgyenpa also had a connection with the Karmapas. At the age of 53, on his way from Mongolia to Tibet, Orgyenpa met the Second Karmapa, Karma Pakshi, and became his disciple. 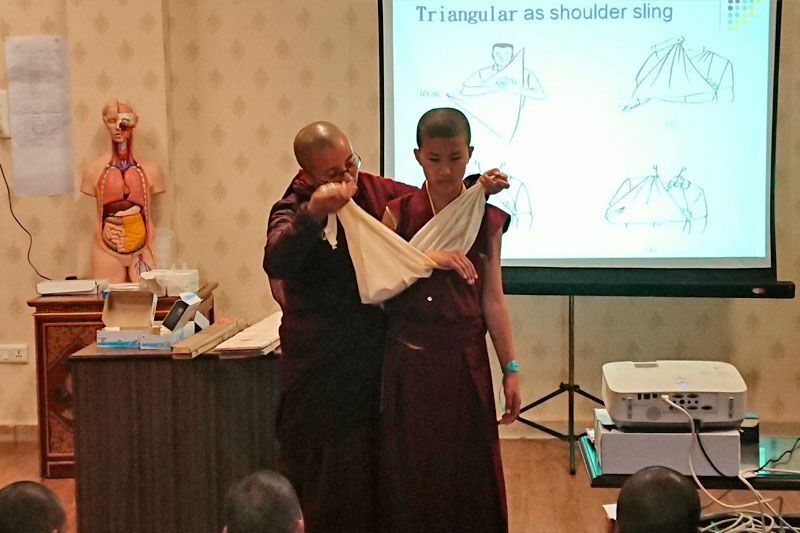 He received the full Kagyu lineage teachings and transmissions, including pith instructions, and was able to attain high realisation. It is said that he and Karma Pakshi became inseparable. 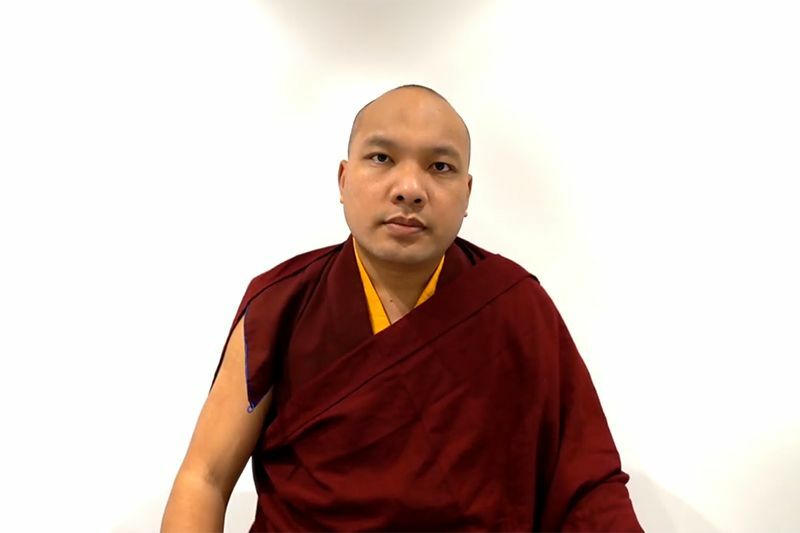 Orgyenpa then served as an important teacher to the Third Karmapa, Rangjung Dorje, when he was young. Some accounts even credit Orgyenpa with identifying him as the reincarnation of Karma Pakshi. The bodhisattva portrayed in this torma is Samantabhadra. The goddess offers the Eight-Spoked Dharma Wheel.